Hygroscopic Earthstar (Astraeus hygrometricus) is a late season, small or medium-sized mushroom—small when closed, medium-sized when open. The fruiting body looks like a puffball at first. As it matures the outer layer of the case splits into 6 to 15 pointed rays, exposing a nearly spherical spore sac. When fully expanded, it can be 3″ or more in diameter. When moist, the rays arch backward to the ground, raising the spore sac, and facilitating distribution of the dust-like spores. The rays sometimes have a pale foreground with dark cracks and crevices, appearing like dried, cracked mud in a dry lake bed. In dry conditions they fold back over the spore sac and become hard. At maturity, the spore case ruptures through a pore at the top, and the spores are disbursed by the wind. Hygroscopic Earthstar has a global distribution. It is common in North America, Central America, and Europe, and has been collected in Africa, Asia, and Australia. In the United States it is common in the Great Lakes and coastal states, uncommon in Minnesota. 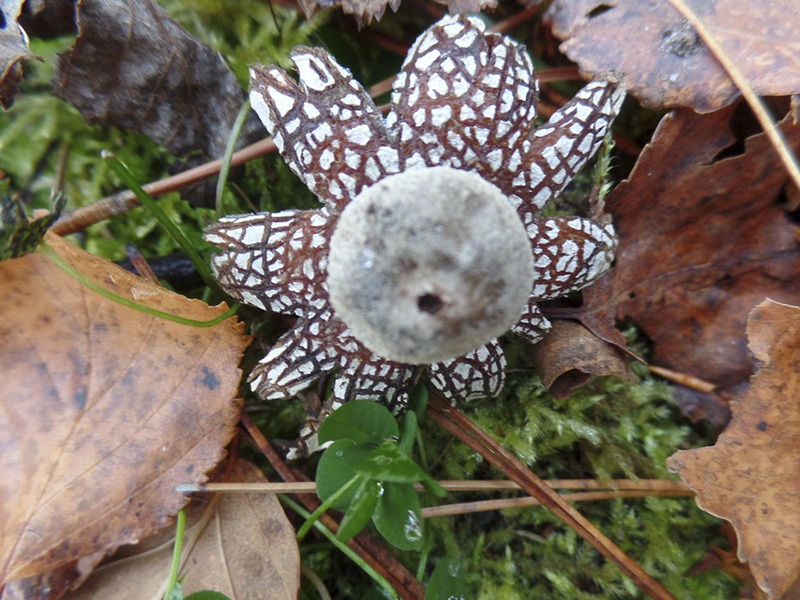 Hygroscopic Earthstar is similar in appearance to true earthstars but it is not even closely related. It is an example of convergent evolution, where species of different lineages evolve similar features. It is identified by the following characteristics: the rays are hygroscopic, expanding in moist conditions and covering the spore case in dry conditions; the upper ray surface is often pale with dark cracks and crevices; the lower ray surface is covered with matted, blackish, hair-like fibers; the spore case is stalkless, roughened by numerous particles, and ruptures through a single, poorly defined pore at the top; and the spores are very large, but this can only be seen under a microscope. This entry was posted in Fungi and tagged Astraeus hygrometricus, Hygroscopic Earthstar on July 25, 2018 by John Valo.